Heat that escapes into the atmosphere from the energy used to warm homes, drive cars and run factories is altering the jet stream and causing wintertime temperatures to rise in remote, sparsely populated stretches of the Northern Hemisphere, according to a new study. The finding helps explain a mismatch of up to 1.8 degrees Fahrenheit (1 degree Celsius) between the observed temperature in some regions and what is produced by models that simulate the global climate. Scientists had attributed the mismatch to natural variability or errors in the models. "We put in our energy consumption [to the models], and bingo! We saw that same pattern," Ming Cai, a meteorologist at Florida State University, told NBC News. 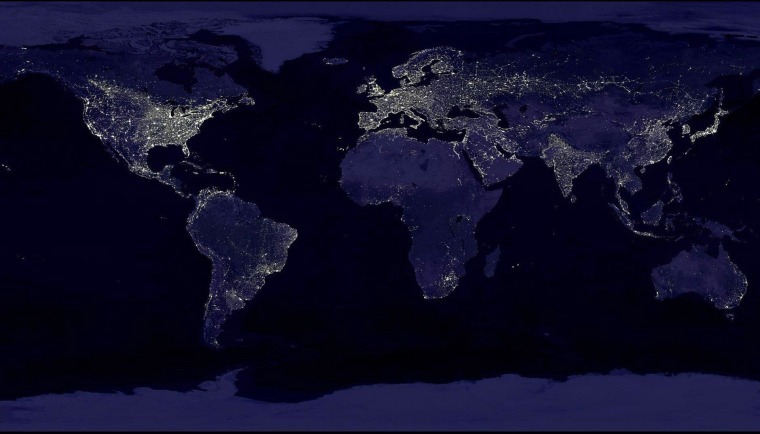 Most of the world’s energy is consumed in the world’s major cities, which tend to be located along the coasts of North America, Europe and Asia. Thus, that's where most of the world's waste heat is generated as well. Cai said he and his colleagues "squashed our hands for a very long time" trying to figure out how the waste heat from cities such as London, Beijing, Los Angeles and New York came to warm up winters in the Canadian Prairie, Russia and Northern Asia. "But we do have some partial story to tell," he said. The team reckons that heat rises up from the cities and interrupts the jet stream, making it "weaker in the middle and wider," he explained. This changes the dynamics of the jet stream enough that it enhances the flow of southerly winds. As a result, more warm air from the south blows north. "What causes that temperature change is not the energy consumption itself, rather the energy consumption changes the circulation, and that changed circulation causes additional warming in other places," he said. The changed circulation is thought to have an opposite effect in Europe, causing a cooling effect that amounts to 1.8 degrees F (1 degree C), experienced mostly in the fall. The net effect on global temperature is almost negligible, the researchers note, but it does help explain why some regions experience warmer winters than projected by the models. "That pattern is not some natural variability or something wrong with the models," Cai said. "It’s just that we haven’t considered this atmospheric forcing, which is energy consumption, in our model." The findings were published Sunday in the journal Nature Climate Change. In addition to Cai, the authors of "Energy Consumption and the Unexplained Winter Warming over Northern Asia and North America" include Guang Zhang and Aixue Hu. Big chill vs. global warming: What's going on? John Roach is a contributing writer for NBC News. You can learn more about him on his website.